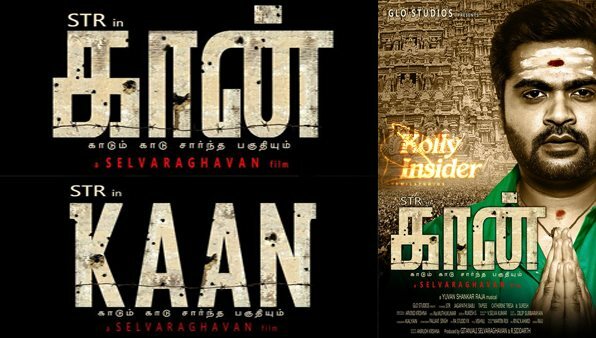 The first look poster of STR’s Kaan directed by Selvaraghavan was unveiled today after trending in twitter since yesterday. The movie is expected to be Selvaraghavan’s comeback and hopefully a controversial -free release for Simbu. Catherine Tresa and Taapsee are playing female leads for STR in Selvaraghavan's Kaan. Jagapathi Babu will be seen in crucial role. Yuvan Shankar Raja and Aravind Krishna takes care of music and cinematography, respectively. In the Kaan poster, one can see Simbu donning a role of a devotee with holy ash and kumkum smeared on his forehead. With both his hands folded in worshiping God, Simbu’s rather humble look has stunned the fans. The actor even sports Rudraksh, which symbolises that he is a devotee of Lord Shiva. While the story of the film has been kept under wraps, this new look of Simbu has taken everyone by surprise. Even in his earlier film Silambattam, Simbu had showcased his tradional side by sporting the role of Brahmin Iyer boy. After being devoid of films for over three years, 2015 promises to be a great year for the actor with 5 releases – Vaalu, Idhu Namma Aalu, Kaan, Achcham Yenbathu Madimaiyada and untitled film with director Ameer.